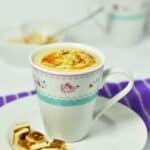 Easy cauliflower soup recipe – who knew roasted cauliflower florets and lima beans with vegetable stock could make delicious soup. 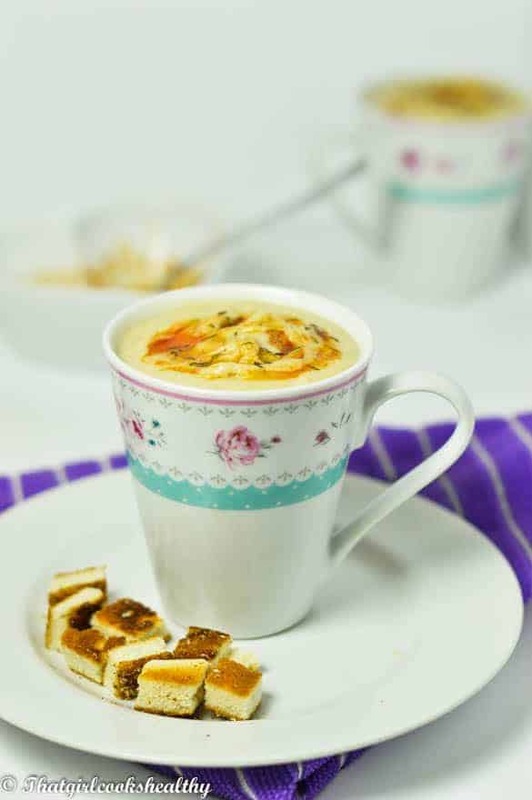 Now that Autumn is in full swing, it’s more than befitting to share this pre-winter easy cauliflower soup. Once the evening begins to darken earlier and the nights are colder, most people prefer to simply wrap up warm and hibernate until otherwise. I’m one of those individuals who likes nothing more than to sit next to the fireplace and snuggle up with a good non-fictional book. Sadly, those days are more of a commodity with such a hectic lifestyle. Another interesting aspect I find when the weather transitions from summer to winter is my mood and general wellbeing. My energy levels begin to decrease and my emotional state is bleak. I remedy this by elevating my fruit and vegetable intake as well as incorporating more raw cacao to stimulate endorphins (happy hormone response). Do give this a try if this is something you’re experiencing too. During the cooler months I love eating healthy comfort food; one pot and soup recipes being my favourite, as they’re incredibly filling and not to mention taste great. This white velvet soup aka my easy cauliflower soup is a favourite of mine, courtesy of my mother, who first introduced me to this recipe last year. I studied her recipe to the point where I was keen to concoct my own version. After some trial and error I finally created my own signature dish – everything made from scratch, veggie stock too. Cauliflower is a superfood and one which was abundant growing up. I don’t think there was a time when cauliflower didn’t make an appearance in our house. For us it was a dietary staple, this cruciferous vegetable is a force not to be reckoned with. High in vitamin c (ascorbic acid) with the ability to replenish white blood cells that strengthen the immune system and can help to reduce an anti inflammatory reaction. Another great thing about cauliflower, aside from being loaded with minerals, additional vitamins and antioxidants, it is high in dietary fibre – great source for promoting healthy bowels. It’s detoxification properties are said to cleanse the colon and activate enzymes. Moreover, cauliflower contains sulforaphane, a sulphur compound which is believed to destroy cancer stem cells. Personally I think black pepper gives a nice little kick. 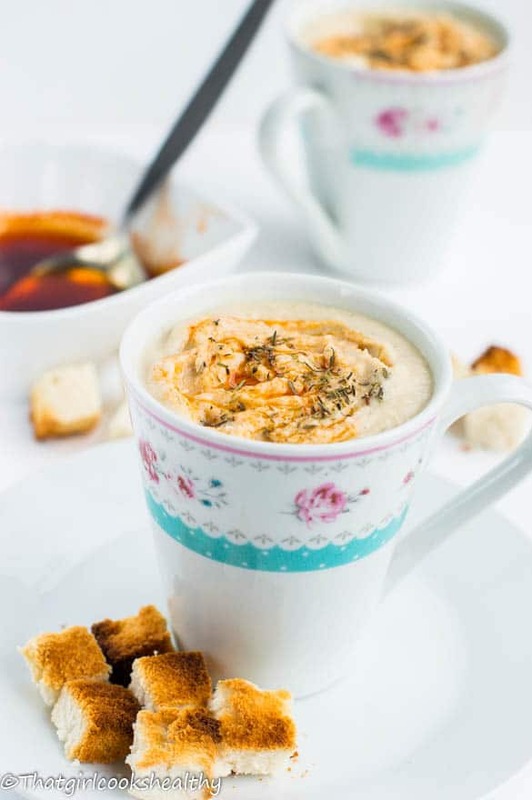 Also if you’re a fan of heat, there’s nothing wrong with adding some chilli, paprika and cumin are also bold flavour which compliment the soup especially upon serving. Low fat and loaded with the right complex carbs which work in cohesion with our blood sugar levels rather than against it. Whether you’re trying to loose weight or seek a recipe that’s filling for the colder months, then look no further. Can I use frozen cauliflower to make the soup? Yes, but because the cauliflower is water logged from being frozen, it probably won’t roast thoroughly so I would skip roasting them and boil them for several minutes until tender, drain and move on liquidising all the other ingredients. Absolutely! This recipe makes a big batch so any leftovers can be frozen. I believe you can keep it frozen for up to six months. 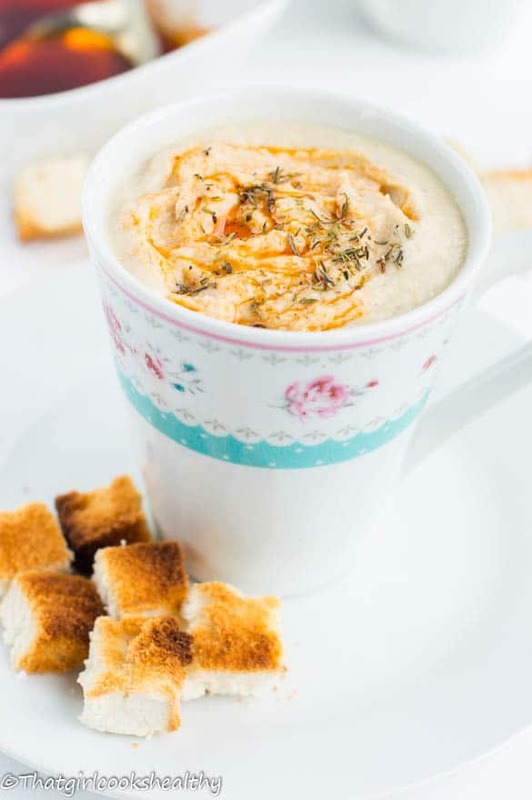 Many people like to garnish cauliflower soup with paprika and some oil but you can use some dairy free cheese, even cumin or simply sprinkle a load of herbs of your choice on top. Place the bite sized florets, garlic and spring onion on a baking tray lined with parchment paper. Drizzle coconut oil over the veggies, making sure both sides are lubricated, this will help to yield browning. Allow to cook in the oven for 30-35 minutes or until everything is slightly brown and almost caramelised. Once done, set the veggies aside to cool for a few minutes. Now we need to make the batch of veggies into a liquid formula. If you have a vitamix, simply add the entire contents (excluding the paprika and olive oil) to the container and blitz until thoroughly piping hot. Alternatively, add everything to a blender or food processor (make sure it’s cool) and whip into a liquid form, then transfer to a pot to heat. If the soup is too thick, thin it out with some more water or stock, 1/4 cup at a time until desired consistency is reached. Mix the olive and smoked paprika together and drizzle over soup.